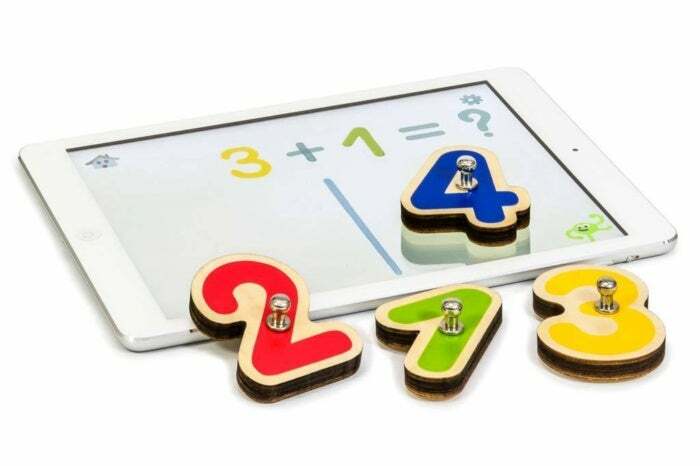 Combines traditional wooden toys with modern tablet touchscreen technology to help kids start learning how to count, read, and write. Where kids are concerned, pairing an iPad with apps is second only to the unbeatable combination of peanut butter and jelly. Thanks to the App Store, a new world of learning and entertainment is available at the fingertips of a new generation. One thing missing from most educational apps is the tactile feel of real-world objects. Although most of us have adapted to the glass surface of smartphones and tablets, nothing beats the touch and feel of holding a toy. French developer Marbotic came up with an ingenious compromise: A series of six tablet apps for iPad or Android devices that work in tandem with wooden letters and numbers children hold in their hands. When stamped against the screen, the apps respond accordingly with spoken words as well as animation, sound effects, and music. Stamp one of the 10 wooden digits included with Smart Numbers against the iPad screen and watch as math becomes more fun. Smart Letters ($50 on Amazon) and Smart Numbers ($35 on Amazon) are sold separately, as well as in an $80 Smart Kit combo (available on Amazon), a savings of $5. Smart Letters includes a complete alphabet of 26 wooden letter blocks, while Smart Numbers offers ten numbers, zero through nine. The kits are recommended for ages three and up, but even my 17-month old daughter had fun with them; several of the connected apps are aimed at kids as young as two, or as old as seven. 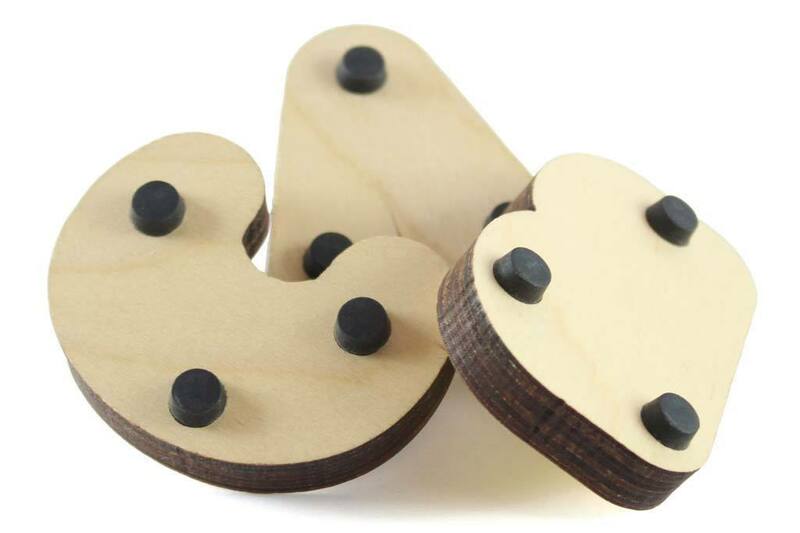 Each wooden block has three soft pads on the back to prevent scratching the display, along with a metal handle used to stamp pieces while playing. Conductive plastic powers each toy using the body’s natural static electricity rather than batteries, and requires no Bluetooth pairing. This approach works well and is safe for kids, although toys are often misread when held upside down. Soft pads on the bottom of each letter or number trigger educational fun on the iPad without scratching the display. There are currently three apps for each set: Alphamonster, Vocabubble, and Bla Bla Box work with Smart Letters, while 10 Fingers, Up to 100, and More or Less work with Smart Numbers. Each is available in paid versions priced between $2 and $3 that work without the connected toys, as well as free versions which can be unlocked by touching a series of requested letters or numbers to the screen. Smart Letters apps are available in six languages—American and U.K. English (the latter excluded from Bla Bla Box), French, Spanish, German, or Dutch, with up to 16 languages supported with Smart Numbers. The apps require no Wi-Fi or cellular data connection, so they work as great in the car or on an airplane as they do at home. I would have preferred to consolidate into a single app per set, but once installed they’re fun and easy to use. All the apps have educational value, but a couple were standouts. Alphamonster gobbles up the alphabet with a “Monstromachine” to help children learn the sounds and shapes of each letter, while Up to 100 uses methods taught in Montessori schools to start teaching kids about tens and units. 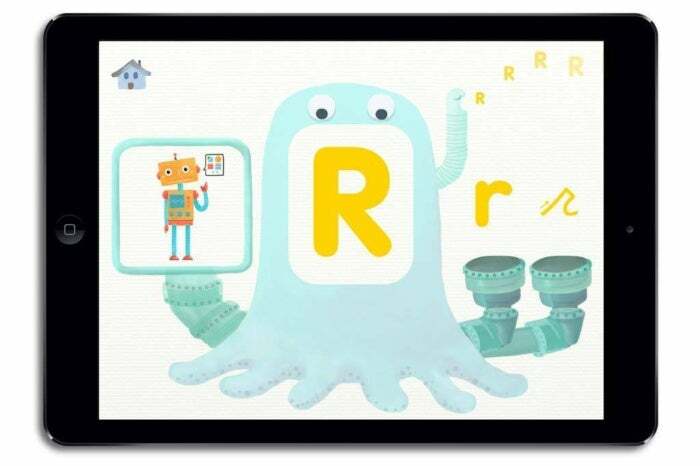 Included free with Smart Letters, Alphamonster reinforces Pre-K education by teaching what each letter looks and sound like. For parents with children between the ages of two and seven, Smart Letters and Smart Numbers provide a great way to mix real-world play with entertaining, educational interactive apps for a winning combination.